Back by popular demand, here's our primer for the top players to watch at this year's tourney, counting down from No. 50 to 1. We made sure all 16 teams in the tourney were represented. Other than that, there were no rules in this exercise (we don’t like rules). Picks are listed below in reverse order, just so you would have to scroll down to see who is at No. 1 (alert fans should have a pretty good guess as to who is at the bottom). Pizza dinners on long bus rides home from section playoff games – not to mention multiple overdoses of excitement -- might have caught up with the diminutive Halonen late last week, as he became sick during Thursday’s practice and left early. Halonen sat out Friday’s practice but has since assured coach Chris Olson he is fine. “He lives for these moments,” Olson said about Halonen, who stands about 5-foot-5 but plays big by cutting down shooters’ angles and limiting rebound opportunities. Big, fast and skilled, Liffrig has all the attributes that make college and pro scouts drool. The 6-2 Liffrig, described by coach Adam Fries’ as the Cougars’ fastest player, has 12 goals and 8 assists this season. The catalyst on the Moose’s all-sophomore forward line, Henrikson’s 15 goals ranks second on the team. 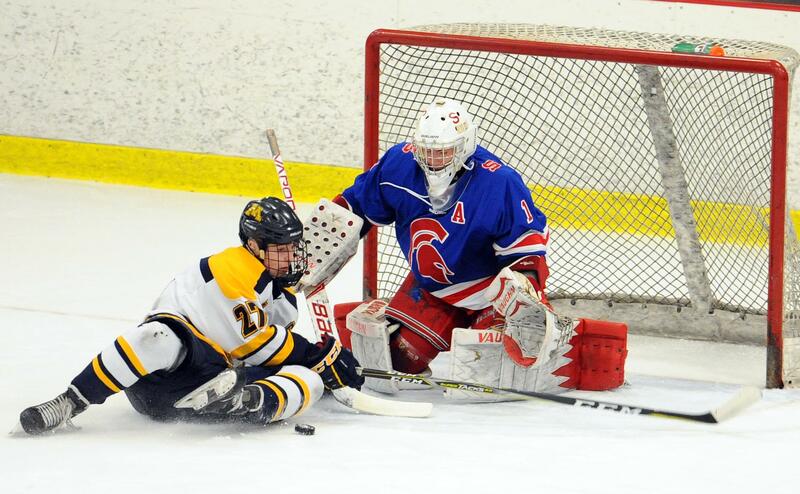 The 5-9, 142-pound sniper scored three of his goals in the section playoffs. “Jeff has been a very, very pleasant surprise for us,” Monticello coach Eric Nelson said. The high-revving, high-scoring transfer from North St. Paul took a while to find his scoring touch with the Zephyrs, but he has amassed seven of his 13 goals in Mahtomedi’s last four games. He is the catalyst on what could loosely be considered the Zephyrs’ second line. Also a lacrosse standout, Babekuhl was in goal for all but one game for the Spartans during the regular season and has seen every minute of action in the playoffs. “He’s probably our MVP,” Orono coach Will Scholz said. “Without him we probably have five wins.” The 5-11, 170-pound Babekuhl has four shutouts among his 20 wins this season. Grangroth has the green light to join the offense at any time, a privilege he used on an end-to-end foray that resulted in a goal in the Class 1A, Section 3 title game against Luverne. When the Dragons are in desperate need of offense, it’s not uncommon for Grangroth to be switched into a forward position. He ranks second on the team with 26 points, including 14 goals. On a team loaded with quality if unspectacular forwards, Dulak is the closest thing the Zephyrs have to a pure goal scorer. The 5-7, 150-pounder went top corner in overtime to beat Northfield in a section semifinal, his 14th goal of the season. Where did this kid come from? Pierre, who stands 5-8, scored eight goals in eight regular season games after joining the varsity late in the season. He added a goal in the section playoffs and is a big part of the Pioneers’ playoff resurrection after an uncharacteristically mediocre regular season. The mid-season move of Anderson from defense to forward proved to be masterful, as the Prowlers have gone 14-3-1 since the switch. Anderson scored a hat trick in the section final against East Grand Forks, giving him 16 goals this season, second most on the team. The kid they call the “Hitman” scored six of his 22 goals in a single, early-February game against Anoka. The 5-9, 163-pound Brickner, who played in the Upper Midwest High School Elite League last fall, has been on a goal-a-game pace in the playoffs. A throwback to an era when top high school athletes played three, four and sometimes even more sports, the 6-2, 200-pound Pedersen excels at football, baseball, track and hockey. Although his Elite League season was cut short in the fall because of a concussion, Pedersen has rebounded by racking up 27 goals this season, almost twice as many as the Dragons’ No. 2 scorer. An extraordinary scorer who loves leveraging his 6-foot, 175 frame on drives to the net, Molenaar has 29 goals this season, easily the most on a Skippers’ team loaded with talented forwards. Remarkably, Molenaar has failed to register a goal in just nine of Minnetonka’s 28 games. A smooth skater and gifted playmaker, the 5-11, 170-pound Oberle ranks third on the Pioneers in scoring with 25 points. Two of his five goals and eight of his 20 assists have come on the power play. 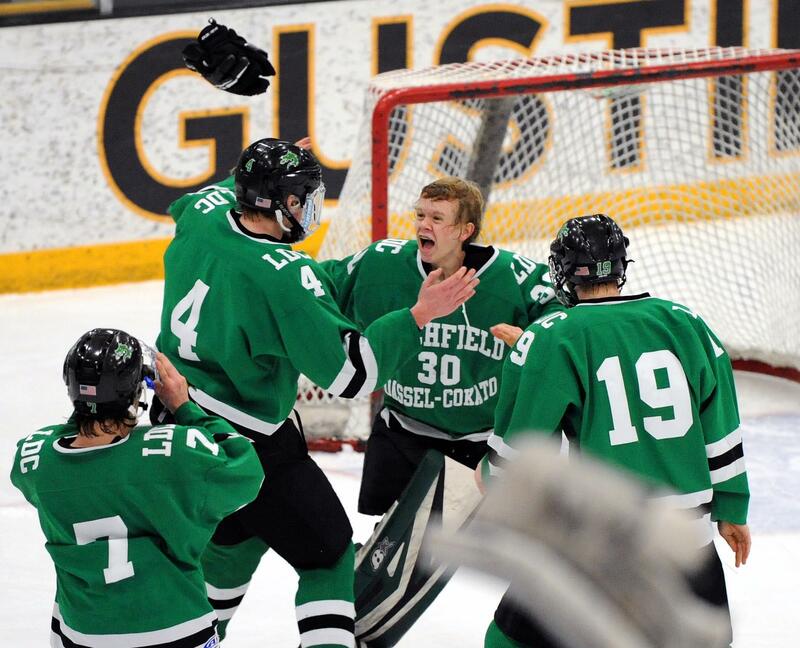 Yes, the 6-foot, 195-pound Daly did leave the ice occasionally during the Panthers’ section championship victory over Lakeville South. Daly’s shutdown abilities and scoring knack (6 goals, 21 assists) make him an every-other-shift-and-then-some player crucial to Lakeville North’s success. The heart and soul of the Zephyrs, the lanky Bartholomew is the team’s top scorer with 28 points. He also plays responsible defense and, with three shorthanded goals, is part of Mahtomedi’s ace group of penalty killers. A key cog on the Cadets’ top line, Christy mixes finesse with grit to great effect. He’s scored 16 goals and has 35 points. Christy represents one half of the state tourney's most fearsome brother combination (see Christy, Ray). Walker’s shorthanded goal in overtime to beat Breck in the Class 1A, Section 2 championship will long be remembered as one of the biggest goals in Orono history. “What people don’t talk about is that 10 seconds before that he blocked a shot and then skated 180 feet to the other end,” Orono coach Will Scholz said. Walker’s 18 goals and 40 points rank second on the Spartans. Small in stature but big in heart (and hockey skills), the 5-5, 145-pound Fleischhacker scored eight goals in six games to start the season. He finished with 18 goals (six coming on the power play), second most on the Pioneers, among his 29 points. First-year Hawks coach Pat Andrews tried multiple line combinations early in the season but eventually locked the 6-2, 155-pound Herter on his top unit. Herter rewarded him by amassing 20 goals among his 51 points. Although sidelined with an injury for about seven games during the regular season, Doherty still ranks first on the team with 15 goals and third in scoring with 27 points. “He’s a game changer, without a doubt,” Resch said. Best player in the small-school tourney? Orono’s Scholz, although somewhat biased, will tell you it might very well be this 6-3, 200-pound stickhandling wizard. Suchy has been a beast in the playoffs, scoring four goals and adding six assists in three games to give him 56 points in all. Lakeville North coach Trent Eigner loves Schneider’s complete game. Blocked shots, hard hits – Schneider delievers a bit of everything. 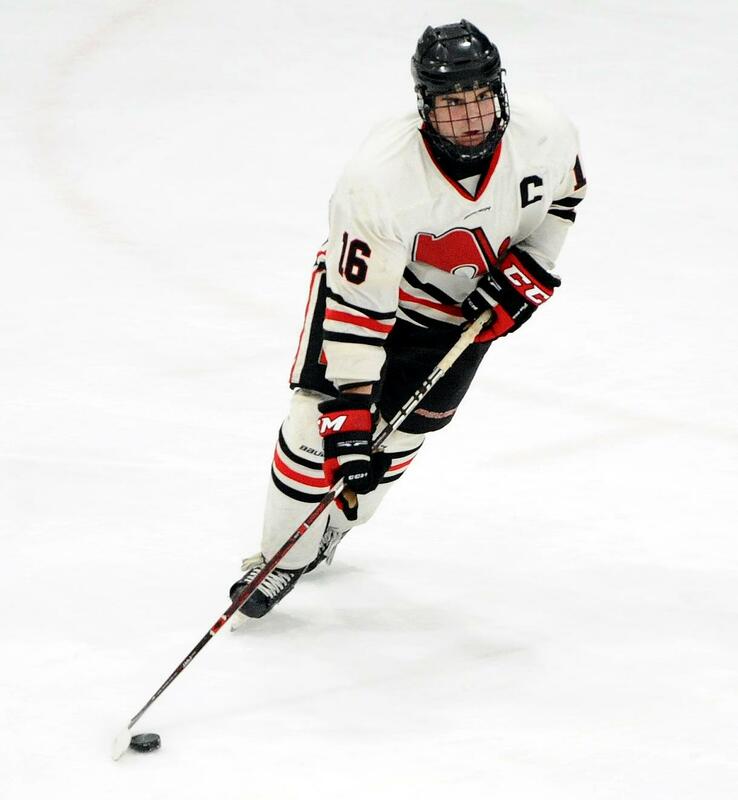 Schneider, who scored twice in the Panthers’ section championship victory over Lakeville South, leads Lakeville North with 25 goals and 45 points. Battling the 6-4, hard-nosed Francis in the corner is no bargain. Losing track of him as a penalty killer is a bad idea, too. Three of Francis’ 10 goals have come shorthanded. He also has 25 assists. The latest in a long line of Prowlers goal-scoring phenoms, the speedy Myers has a team-best 27 goals this season. It’s not a stretch to describe Myers as streaky – he erupted for four goals in a single game three times this season. When Klatt was on this stage a year ago, he might very well have been the tournament MVP with his three-game run of state tourney brilliance. Can he do it again? The 6-2 Klatt’s statistics (16 wins, 2.25 goals-against average, .906 save percentage) suggest yes, even if the Moose’s first-round draw (two-time defending champion Hermantown) screams no. The Knights’ other irrepressible sophomore, Flammang routinely deposits many of those Laylin passes into the back of the net. The fearless 5-10, 155-pound wing has scored a team-best 25 goals, including one in each of STMA’s three playoff games. After four years of toiling in relative obscurity in southern Minnesota, Cusey finally gets to put his considerable game on the state’s biggest stage. Unquestionably the greatest goalie in Mankato East history, Cusey has a 1.83 goals-against average and .931 save percentage for a team that managed just 66 goals in 25 regular season games. A gifted skater, Boltmann plays with an edge that makes life difficult for opposing forwards. When he isn’t winning corner battles or bulldozing bodies from the front of the net, Boltmann chips in offensively to the tune of 15 points (2 goals, 13 assists). Bayless has a knack for sneaking into open areas around the net. And when Bayless is unchecked and has the puck, the most common result is a laser shot into the net. Bayless, who has 22 goals, is underrated as playmaker, too. We continue our run of three straight snipers here with Matsui, who, incredibly was held without a goal in just five regular season games. He leads the Cadets with 28 goals and, like Bayless, isn’t bad as a setup man either, as his 30 assists attest. The best pure scorer on an Edina team loaded with them? It might just be Jungels, who possesses wicked speed and an even more evil shot. His 27 goals rank second on the Hornets. Big (6-foot, 190) and strong, Helgeson also possesses plenty of skill. A mainstay for the Pioneers since he was a freshman, Helgeson leads Hill-Murray with 19 goals and 35 points and provides veteran leadership on a team loaded with young players making big contributions. Search for a definition of relentless, and picture of Nevers stealing the puck from a defenseman might just pop onto your screen. 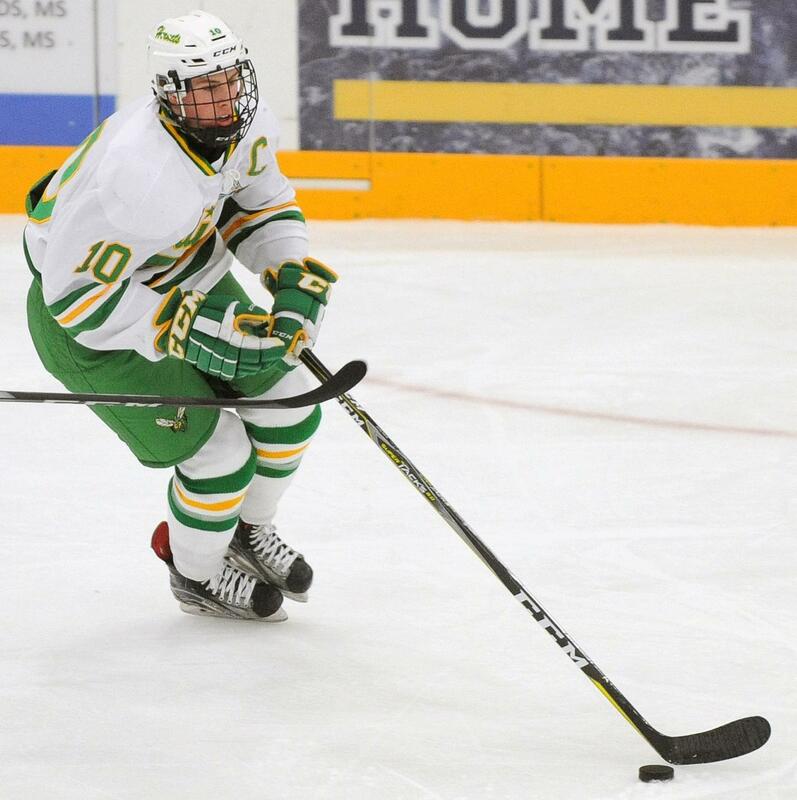 Nevers was a terror playing with Edina center Demetrious Koumontzis in the Elite League last fall, and Nevers’ ferocious forechecking has been equally effective for the Hornets this winter. His 60 points rank second on the team. The other half of the state tourney's most fearsome brother combination (see Christy, Rob). Plays tough, plays smart, scores, sets up goals, strong defensively, good leader … yup, that adds up to a pretty complete package. Christy has 58 points, and almost half of his assists (19 of the 43) have come on the power play. The 6-foot, 200-pound LaMaster can lug the puck up the ice if necessary, but most often chooses to make the simple, smart play. LaMaster, a Mr. Hockey finalist, scored four goals and racked up 31 assists as Duluth East’s defensive linchpin. Those seeking highlights of a spectacular nature need only to point the camera at McGregor, hit record and let the good times ensue. The 5-11 Mr. Hockey finalist with more moves than a U-Haul trailer led the Cougars with 28 goals, included two in each of Centennial’s section playoff victories. The forward-turned-defenseman has great offensive instincts, and he parlayed them into a 21-goal season, an eye-popping total for a defenseman. The smooth-skating Foley has scored four of his goals and 12 of his 50 points in the playoffs. It’s too late to say Biondi, the son of former Minnesota-Duluth star Joey Biondi, is the next great Hermantown player. The 5-11, 174-pound winger is already dominant, as evidenced by his team-leading 27 goals. Donovan’s size (6-4, 185) and smooth skating is reminiscent of that of former Blaine and Gophers star and current Florida Panther Nick Bjugstad. Although he’s scored just 11 goals, Donovan showed his unselfish side this season by happily settling into a setup role for goal-scoring machine Garrett Worth. The epitome of a power forward, Loheit is more freight train than he is a finesse guy. His forward line gets all the toughest defensive assignments, yet is expected to contribute on offense, too. The Mr. Hockey finalist scored 14 goals and had 32 points. After dominating the Elite League in the fall as its scoring leader, it only figured that Koumontzis, a Mr. Hockey finalist, would be just as dominant this winter. As the centerpiece of the Hornets’ second forward line, he finished fourth on the team in scoring with 45 points (22 goals, 23 assists). This year’s Rickie Fowler Award (best player in the tournament without a Division I scholarship), goes to Watkins, who has excelled at every level and is in the midst of a superb (25 goals, 41 assists) senior season. A Mr. Hockey finalist, Watkins stands 5-8¼, and will likely need to prove himself yet again in junior hockey before moving on to college. There’s no such thing as impossible when Brink has the puck. His passes have a habit of threading through even the most daunting mazes of sticks and skates, and he rifles home goals from the most unlikely of angles. Brink, the type of player who puts fans on their feet every time he touches the puck, has 16 goals and 33 assists this season. A thoroughbred who can go end-to-end at any moment, Brinkman is just as comfortable starting or finishing scoring plays. Hard hits are a big part of his game, too, and opposing players are well-advised to keep their heads on a swivel when Brinkman is on the ice. He has 11 goals and 33 assists this season, with 13 of his points coming on the power play. Best Goalie in the State Tournament award goes to Kelly, at least before the games start. He’s won 18 games, allows just 1.32 goals per game and stops 93.9 percent of the shots he faces. On team that traditionally rotates two goaltenders in the regular season, Kelly, a finalist for the Frank Brimsek Award that goes to the state’s top senior goaltender, was the Cadets’ starter in all but a handful of regular season games. Described by some as the best goal scorer to come out of Duluth since the great Dave Spehar, Worth’s 42 goals rank as the second most in the state this season. A Mr. Hockey finalist, the 5-8¼ Worth has scored two or more goals in a game 16 times this season. Strong defensively, Luedtke sets himself apart with his knack for knowing when to join the offensive rush. That would be most anytime, but especially in overtime. He scored the winner in double overtime against Holy Family Catholic in a section championship. Luedtke started the season in similar fashion, scoring in overtime against St. Thomas Academy in the opener for both teams. Luedtke, who missed eight regular season games with a broken collarbone, has eight goals and 23 assists. The prohibitive favorite to win this year’s Mr. Hockey award, Walker combines elite level speed with both a playmaker’s and goal scorer’s touch around the net. Throw in a drive-defenses-crazy tenacity, and you get a player that’s all but unstoppable. Did we say unstoppable? Walker was all that while scoring 32 goals and amassing 68 points.